The Mannequin starts in a Trapeze. 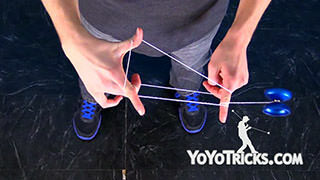 Then we are going to take our opposite hand thumb and put it into the trapeze loop. Next, take your throwhand pointer finger and thumb, and bring it in front of these two strings. Grab each one with your two fingers. Then, take your opposite hand and bring it in line with your throwhand. 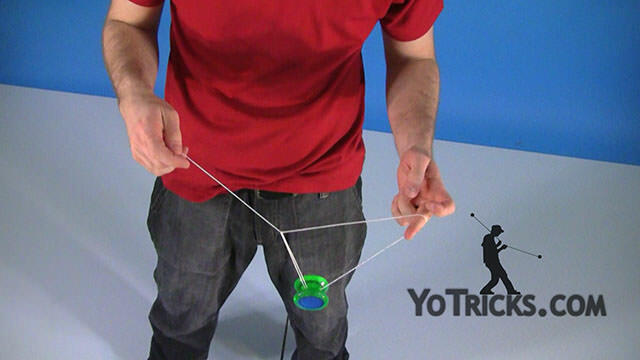 Then swing the yoyo up so it lands on this string on the bottom, from behind. Then just take out your opposite hand thumb and throwhand thumb. Point your pointer fingers forward, and you are now in the mount for the next element. 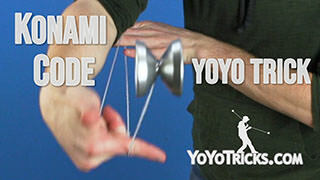 Now, this mount looks a lot like a kamikaze mount, but the string is actually configured a little bit differently. So we are going to take our throwhand thumb, pinch the string on our throwhand pointer finger. 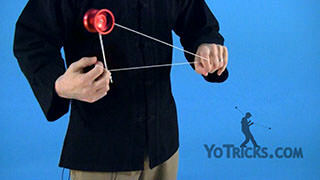 Then we are going to swing the yoyo around, just like in a Trapeze and his Brother Slack. 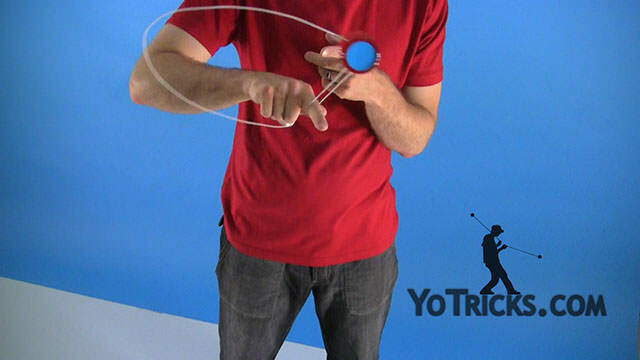 As the yoyo is coming around, you want to take your opposite hand pointer finger and stick it into this loop between the yoyo and our throwhand pointer finger. So, as the yoyo is coming around, I am going to stick my opposite hand pointer finger in. 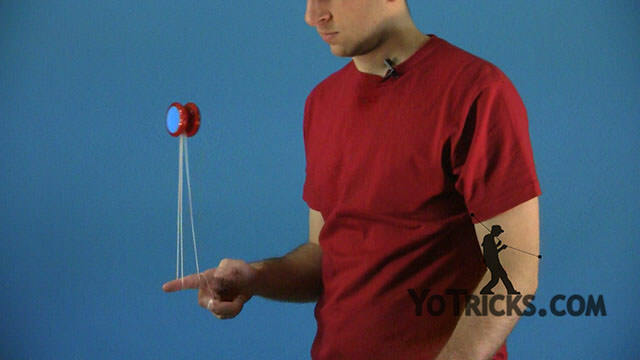 Pull my hands apart so that the yoyo lands in the middle. 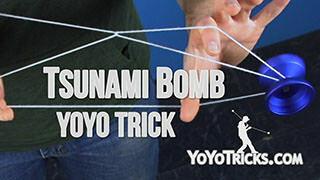 When you are first attempting this trick, it can be tempting to do it like a suicide, where you catch the end of the loop with your opposite hand pointer finger, just like that. 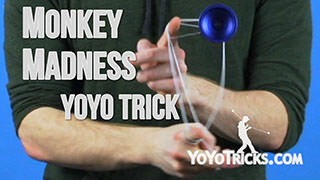 But this is really tricky to do, so I would not encourage practicing this method. 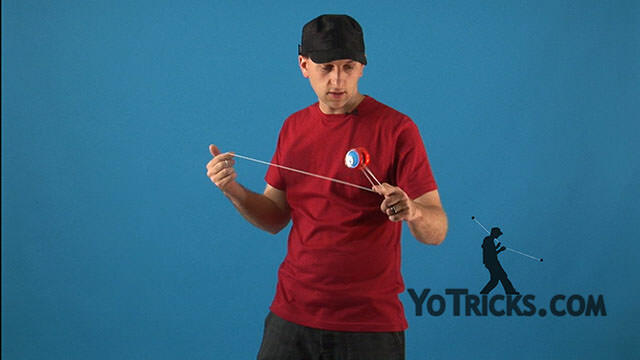 Instead you want to make sure to bring your opposite hand pointer finger close to your throwhand pointer finger so that when the slack is coming around, you can put your opposite hand pointer finger into that loop, bringing your hands apart. You will have a lot more success with this method. 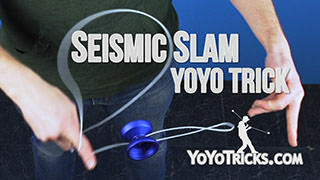 From here, we are going to roll the yoyo over our throwhand. 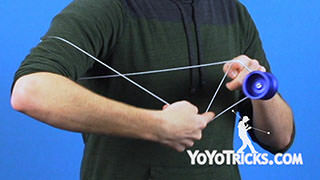 Then we are going to take the bottom three fingers on our throwhand and stick them into the loop, so that this top string is between our throwhand pointer finger and thumb. 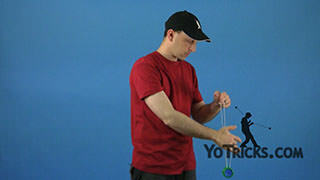 Then we are going to roll the yoyo over our opposite hand and land on the back string. 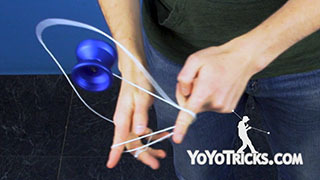 Then, take your opposite hand thumb and pinch the string leading to the yoyo. 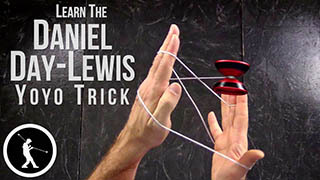 Then drop the slack loop on the front of your opposite hand pointer finger. 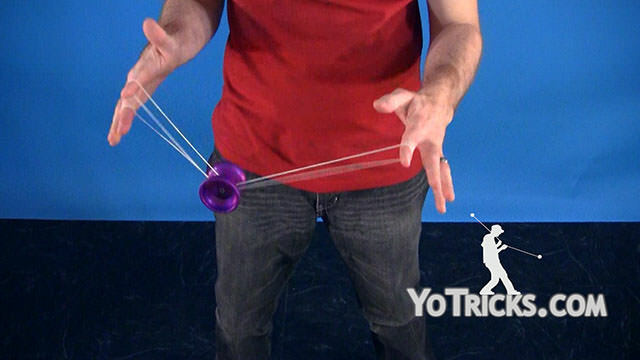 Swing the slack over your throwhand. 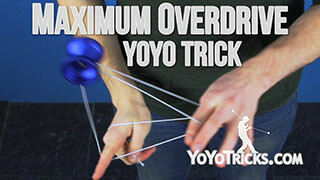 Then swing it over once more, so that the slack goes over your throwhand wrist. 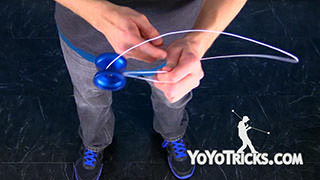 Then put the back string of the slack on the front half of the yoyo, just like this. 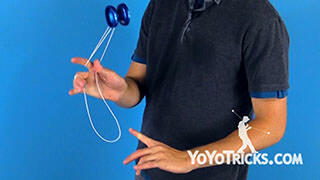 Then take your opposite hand pointer finger and undercut the yoyo. 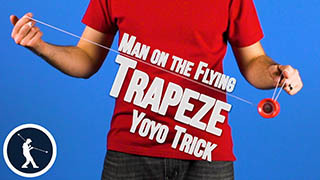 You are now in a Trapeze and his Brother-like mount that we show you in our Green Triangle Basics video. 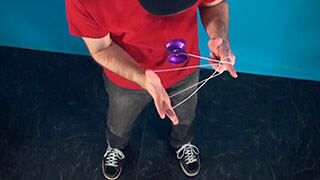 So, if you want to skip the first part of the trick and just go back to this mount to practice the last slack, you can just go right here. 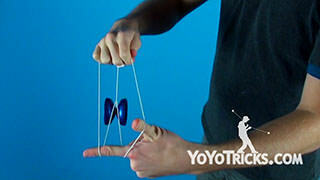 Then once you are here, you can just swing the yoyo over your throwhand once more, so you land into a Double-On. 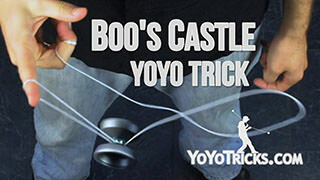 Now, next we are going to hop the yoyo up to the back and you will see that as I hop the yoyo up, there is a loop going around the yoyo. 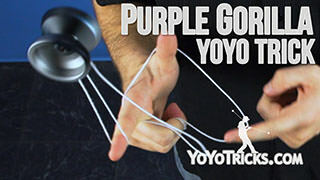 So I am going to take my opposite hand thumb and pluck it on the opposite hand string side of that loop. 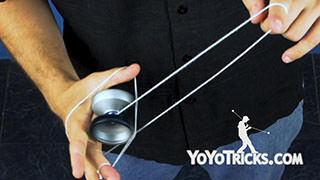 So that the yoyo comes down and lands on the back string. Now, it is possible to land it on both strings, and if that happens, just take the front string out. Now, from here, we want to make sure to separate the strings on the top of our throwhand. Then take your throwhand thumb and pinch the string leading from the yoyo against your throwhand, just like this. 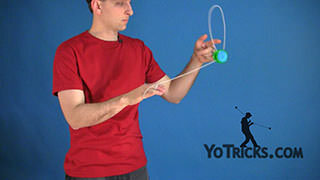 Next we are going to hop the yoyo off the back so that we now have these two slack loops, and the yoyo hanging down just like this. 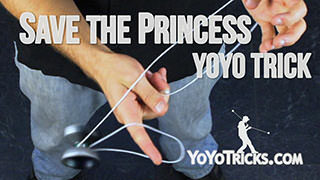 Now you can also choose to pinch the string leading from the yoyo between your throwhand ring finger and pinky finger, and you might find that makes the trick a little bit easier to hit for you. Once you are here, we are going to do a Keychain-type motion. So just like we are swinging in a Keychain mount around our throwhand pointer finger, to kick these two slack loops over our throwhand. 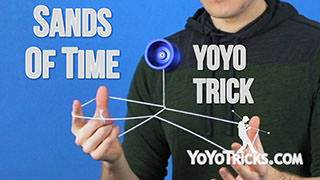 So I am going to kind of swing my hand over like this, and you will see that both slack loops come around, and I can catch them on my opposite hand pointer finger. Now, while you are doing this, it can also help to kind of kick the back of your throwhand out. That can sometimes help the slack loops get over a little bit easier. 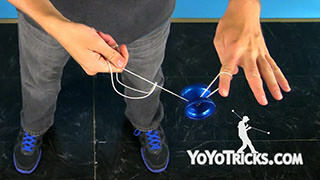 Now, catching both of these at the same time is a little tricky, so if you do not catch them, you can always just kind of find where they are while they are hanging down, put your opposite hand pointer finger in, and there you go. 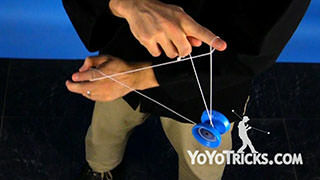 Now from here we are going to drop our throwhand thumb so that the yoyo is swinging. 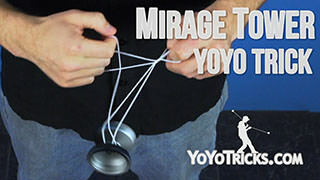 We just want to swing it over our opposite hand, pull our hands apart, and land the yoyo on the back string. Then we can drop the loop on the back of our throwhand, and we are now in our Green Triangle. 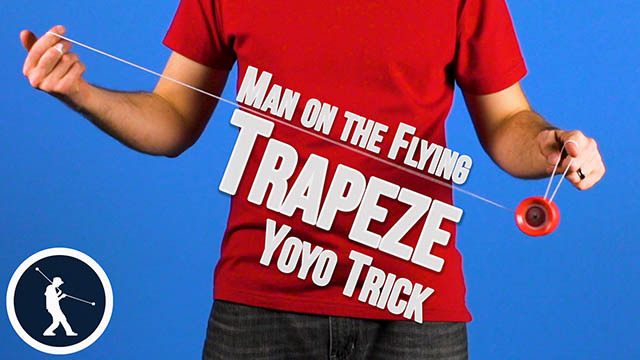 Just hop the yoyo out of the back, land it into a trapeze. 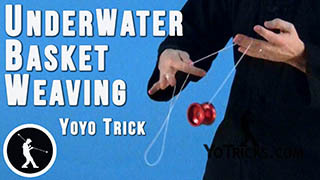 Go into an undermount, swinging the yoyo toward our opposite hand side, performing a bind. And that is the Mannequin Double Slack. 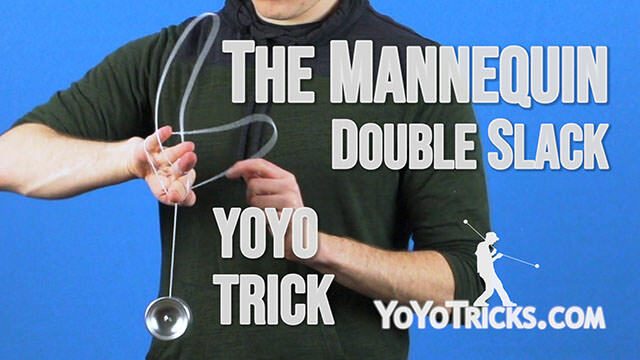 In this video, I am going to teach you how to do the trick the Mannequin, and it looks like this. Uh-Oh.